Thomson Software Solutions is the leading supplier of software for vision testing and screening in the UK. Our portfolio of programs is at the cutting edge of vision assessment and is already in use in over 8000 consulting rooms, hospitals and schools. Our flagship Test Chart software is used in thousands of optometric consulting rooms and many of the major hospital eye departments including Moorfields, Great Ormond Street, Southampton, Bristol, Addenbrokes and many more. It is also used in the clinics of all the University Optometry Departments in the UK. However, we never stand still and we are constantly adding new tests and features. We believe that this keeps the software at the vanguard of innovation in clinical vision assessment - and our 8000 or so users seem to agree! Our other software has been equally successful. iChart2000 brings over 500 near vision tests to your iPhone or iPod touch while the Vision Toolbox does the same and more on the iPad. No wonder both have been downloaded by thousands around the world. The Clinical Eye Tracker has revolutionised the clinical assessment of eye movement and binocular vision by providing and affordable method for monitoring the exact position of each eyes while performing dynamic tasks. The Digital Field Screener provides a sophisticated way of screening for visual field defects using a laptop. It is ideal for domicilary testing, mobile clinics or even as a backup within clinics. The ReadEZ system provides and efficient and modern way of diagnosing and managing Visual Stress. Over 400 practices now use the system. Insight is the result of a collaboration with animation experts, Medivision. It provides over 50 high quality animations explaining most of the common eye conditions and treatments. EyeTV entertains and educates patients while they wait to see you and the WebPak allows you to add stunning eye-related animations to your website. All our programs (with the exception of the Apps) are designed to run on a PC running Windows. The programs are supplied with detailed instructions and all the required accessories. All programs are thoroughly tested and are simple to use. We also offer on-going helpline and Teamviewer support for registered users. The company was founded by Professor David Thomson in 1995. 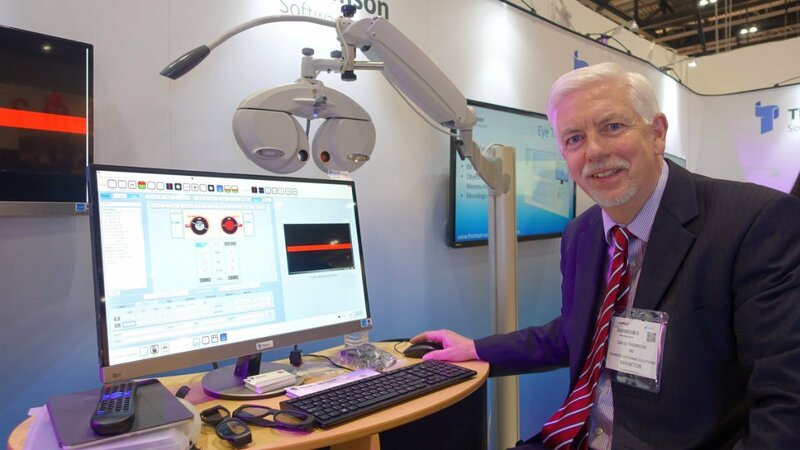 Professor Thomson spent most of his professional life at City University where he lectured in Clinical Optometry and Visual Perception before becoming Head of Department. In the late 90s he recognised the potential of emerging computer and display technology for clinical vision assessment and started developing software to exploit the new technology The first program was launched in 1992 and from these humble beginnings, Thomson Software Solutions has become the leading supplier of vision assessment software. Professor Thomson continues to lead the company while lecturing widely in the UK and overseas.